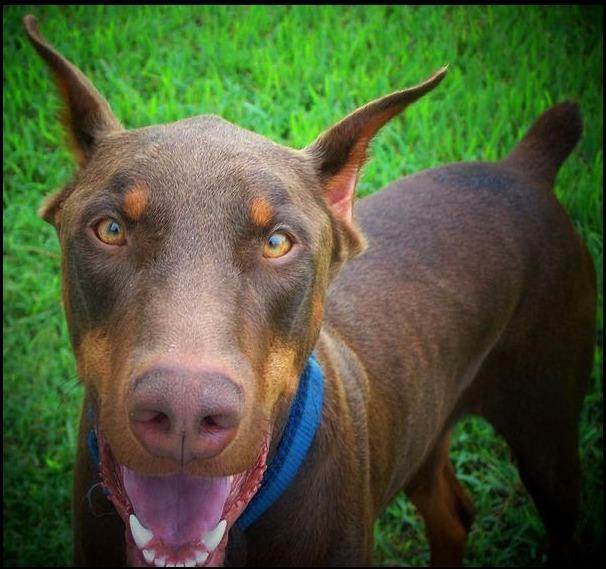 When a co-worker's parents were tragically killed, she (their only daughter, named Barbara) needed to find homes for 7 Doberman Pinschers that functioned as estate guard dogs. I was very hesitant at first, being concerned that a guard dog who had truly been a "working" guard dog since adolescence and not a family pet in any way would not transition well into the loving companion I wanted. I traveled to her parents' estate where Barbara brought Bernie inside to meet me. He was absolutely gorgeous - a large 2-year old with a beautiful coat and the most intelligent eyes I've ever seen. Those eyes locked with mine and suddenly they became very gentle. It was as though he was trying to assure me that - despite his day job as a guard dog - he was someone I could trust and enjoy. Barbara had the dogs' handler talk to me for about an hour and then demonstrate the verbal and hand commands which Bernie had been taught. We walked him together and put him through his paces and, throughout the exercise, he kept those eyes trained on me. It was almost as though he was assessing ME as an owner as I was assessing him as a pet. Three hours later, Bernie got in the front seat of my two-seater car and away we went. I am NOT afraid of dogs, but this was a guard-trained Doberman and we had only known each other a very short time. So, I was a little nervous. UNTIL about 15 minutes into the drive home, he leaned over and put his head on my shoulder and sighed. It was the single most connective moment I have experienced in a lifetime of owning/caring for animals. Bernie and I were a couple for almost a decade until a hip/bone disease took him. And during that time, there were challenges. He - being trained to "guard and protect" at ALL times - struggled to understand that he did not need to protect me from family and friends. He spent a lot of time sitting on my feet, making sure he put himself between me and them! It took him a very long time to relax around the people that I told him were trustworthy. And I had my own learning curve. Foremost, I had to learn that he had always had a job and when he did not have "tasks" or work to do, he became concerned and depressed. But Bernie and I figured it out. And I believe that anyone considering adopting a working guard dog can as well. You must go into the adoption understanding their need to work, being willing to allocate at least a couple hours a day to interaction that is formal and command-oriented so they feel needed and relevant, and being patient while they learn who in your life has permission to be close. You may also face some concern from neighbors as well as strangers when out in public with your adoptee. Some of these large, strong breeds are still viewed as dangerous by those who are not familiar with them. Overall, though, I would say that if you have the time and are able to make the commitment, adopting a guard dog can be one of the best animal relationship decisions you will ever make!